With the use of PubSub, the worlds of gadgets and portlets blend together, facilitating their ability to communicate and interact with each other. Publishers don’t send messages to subscribers directly; instead, they publish messages that are characterized into classes and sent across message channels (topics). Therefore, the publishers have no knowledge of whom they are sending their messages to; they simply broadcast the messages over a channel. So you may ask: “How do subscribers receive messages if the messages are not sent directly to them?” Subscribers express interest by subscribing to certain channels. Once subscribed, they receive messages sent to those channels. Like publishers, they have no knowledge of who sends the messages, they only know channels and receive messages coming in on those channels. This process makes it much easier for multiple gadgets and portlets to communicate with each other, without specifically stating with whom they are communicating. PubSub can be compared to a TV station and your TV. The TV station does not directly send their material to your TV, but instead broadcasts the material over a channel. You subscribe to that channel by tuning your TV to that channel to watch what’s on it. This process of broadcasting and tuning into TV programs is similar to publishing and subscribing to messages sent via PubSub. PubSub also offers the ability for portlets and gadgets to publish to and subscribe to multiple channels. Although this may seem like a complex process, PubSub’s use of message channels creates a network for gadgets to communicate across, and the network is easy to maintain and understand. Navigate to the Control Panel and select OpenSocial Gadget Publisher from under the Portal heading. Select Publish Gadget and, for each gadget, enter the URL and click Save. Click Publish a random number on the PubSub Publisher gadget. 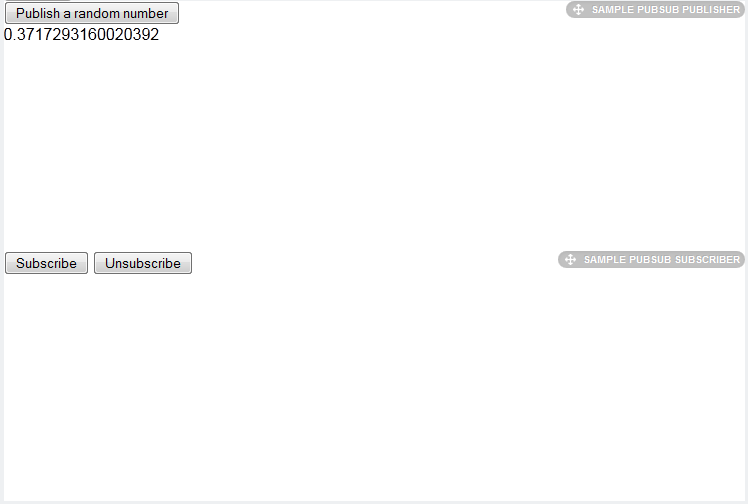 Notice that it publishes a number; but the PubSub Subscriber gadget does not receive the number. Figure 13.2: The subscriber cannot receive any messages from the publisher without being subscribed to the channel. Select Subscribe on the subscriber gadget. Click Publish a random number again from the publisher gadget. You now see the random number received by the subscriber. Figure 13.3: When the subscriber is subscribed to the publisher’s channel, the subscriber is able to receive messages. Select Unsubscribe on the subscriber gadget. Click Publish a random number. As you would expect, the subscriber portlet no longer receives the random number. I bet you are wondering how to implement PubSub messaging in your gadgets and portlets. We’ll dive into the code next. In fact, we’ll complete exercises demonstrating gadget to gadget interaction and portlet to gadget interaction. Add both gadgets to a page. Figure 13.4: Gadgets are easy to publish and some gadgets, like Google’s Address and Map gadgets, are automatically synced to communicate with each other. Note: The address bar is already filled with an address. This default address is specified in the Google Address gadget’s source code. We will edit this setting using Liferay’s gadget editor later in the chapter. Input an address into the Address bar and then click Update. You should now be able to see that address location displayed in the Google Map gadget. Figure 13.5: After inputting a custom address in the Google Address gadget, you are able to see its physical location in the Google Map gadget. Congratulations! Your gadgets are communicating well with each other. This simple example demonstrates two gadgets communicating with each other using PubSub. We will now dive into the source code and analyze how this interaction is accomplished. Notice the opening <Require feature="pubsub-2">, mandating the pubsub-2 feature for the gadget. The <Param name="topics"> section establishes the topic com.liferay.opensocial.gmapsdemo that the gadget publishes to. Within the topics parameter, you define all the topics your gadget uses for communication. Furthermore, the publish="true" attribute specifies the gadget’s role as a publisher to the topic. When the user clicks the gadget’s Publish button, the message is sent by the publishing gadget to the topic named com.liferay.opensocial.gmapsdemo. PubSub broadcasts the message received on that topic to all subscribers, such as your Google Address gadget. Each subscriber receives and processes the message. In the case of your Google Maps gadget, the message, containing an address, is processed by the gadget to show the address location on its map. The subscriber source code is similar to that of the publisher. It mandates the pubsub-2 feature for the gadget and specifies com.liferay.opensocial.gmapsdemo as one of its topics, as you would expect. Of course, the only difference is the fact that this gadget subscribes to the topic, hence the attribute setting subscribe="true". The gadgets.HubSettings.onConnect function is called by the OpenSocial container once the gadget connects to the PubSub messaging hub. In our example, the gadget subscribes to the previously mentioned topic. All subscribers to this topic receive messages sent to it. When a message is received, the gadget’s callback() function is executed. In this example, the callback method sends the received message (the address sent by the publisher) and calls GClientGeocoder.getLocations() to get the locations. And finally, the locations are processed and displayed on the map. In summary, subscriber gadgets need to specify a topic and register a callback function on that topic to handle the messages they receive. As you can see, PubSub allows your site to run efficiently and enables otherwise unconnected gadgets to communicate and flourish within Liferay Portal. Gadgets are not limited to only communicating with other gadgets. In the next section, we will demonstrate the capabilities of communication between portlets and gadgets. For this section, we will continue implementing the Google Map gadget on your site. If you have portlet applications that can take advantage of the functionality your Maps gadgets have to offer, it would certainly be convenient for a user to allow communications between those gadgets and your portlets. As a demonstration, we will send messages from a Directory portlet to the Google Map gadget. For each user listed in the Directory portlet, we will create a Show in Google Maps link that, when selected, displays the location of the user’s address in the Google Map gadget. This portlet is much like Liferay’s Directory portlet. The first thing we need to do is edit the portlet’s address.jsp file to configure a Google Maps link. 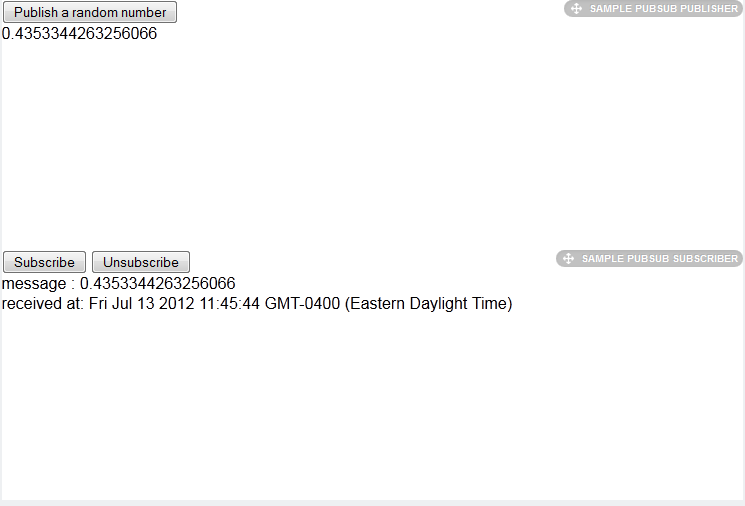 This code involves a publishAddress() function that’s called whenever you click on the Show in Google Maps link. The function invokes the Liferay.fire() function, passing in the name of the channel receiving the message and the user’s address as the message. One thing to note is that when a portlet sends data to a gadget, there must be a gadget: prefix before the channel declaration. This distinguishes who the messages are intended for when they are broadcast across a channel. Notice that you don’t need to change anything for your Google Map gadget, since it’s already subscribed to that channel. You only needed to define the Directory portlet as a publisher to that channel. Note: If you would like to broadcast messages to portlets, follow the same guidelines, but don’t use the gadget: prefix in your topic parameter value for the call to the Liferay.fire() function. Figure 13.6: Your modified Directory portlet sends a user address to the Google Map gadget to display the address location in its map. Letting your portlets communicate with gadgets enhances your portlet applications and gives you a plethora of different ways you can enhance your users’ experience. We will now switch gears and dive into Liferay’s gadget editor!